In November 1999, EPA issued TVA an administrative compliance order (ACO) alleging that TVA modified a number of coal-fired units at nine of TVA’s plants without first complying with Clean Air Act (CAA) preconstruction obligations that include obtaining preconstruction permits and installing and operating state-of-the-art pollution control technology (CAA Prevention of Significant Deterioration/Nonattainment New Source Review provisions, 42 U.S.C. §§ 7470-7492, 7501-7515). 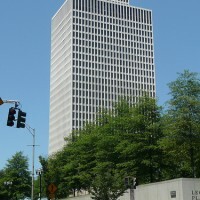 In this massive multi-billion dollar settlement, a small portion of the funds, $26.4 million, has been allocated towards improving energy efficiency in various state projects including buying 5 electric Nissan Leaf vehicles, but the centerpiece seems to be installing window tint on the Tennessee Tower, a landmark building. Bob Martineau is commissioner of the Department of Environment and Conservation. He says in its first year, the state will upgrade one of its most visible facilities, the Tennessee Tower in Nashville, with insulating film over its hundreds of windows. The two year payback sounds a little fast, but with today’s increased energy prices, it is quite likely that payback period can be shortened from 3 years down to 2 years with a bump in electricity prices and a seasonally hot summers.